Bulk personalized chapsticks with versatile clip caps for our outdoor fans. Great for the beach, golf course, skiing... any outdoor activity. Provides quick access to moisturizing lip protection. Budget Prices in USA or Canada for customized chapsticks in bulk. 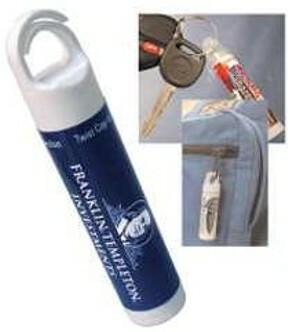 The clip allows you to attach the chapstick easily to any key chain, jacket, backpack, belts, and golf bag. Our clip chapsticks are Made in USA and FDA approved. Free full color imprint, Free artwork design. We will send you a proof for your approval before production. Setup Charge: $35.00 for any number of colors. Production time: 7-10 days after art approval. Flavors: Cherry, Mango, Peppermint, Pomegranate, Red Raspberry, Tropical Pineapple, Vanilla and Natural (non-flavored). Imprint area: 1.75" x 1.5"
• FREE Full Color Imprint! Optional Key Ring (see picture): add $0.12 per chapstick. Optional Carabiner (see picture). 1-7/8" long: add $0.25 per chapstick. Item #: CAR.